Chevelle lovers know that few models are as sought after as the Super Sport 396, but finding one that’s original can be harder than you’d think. While originally a model, it was later changed to an option package. Additionally, as with any desirable collector car, services that specialize in making replica parts have made it easy to create SS clones. When attempting to determine if a Chevelle is a true SS, the first and easiest way is to look at the VIN number, but there’s still a few things you’ll need to know beyond that to be sure. 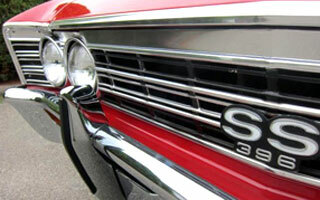 The VIN can generally be used for any Chevelle model from 1966 to 1968. The SS was produced as its own model during those years as the SS 396, and as a result, any original SS had an “8” as the third digit in the VIN. If you’ve been on the lookout for an original SS Chevelle, you’re probably looking for one that’s listed as a “true 138.” While the VIN is a good indicator, it’s still invaluable to have access to the original documentation. By ensuring that the VIN on the dashboard is the one on the paperwork, you can be one step closer to ensuring the authenticity. Duplicating original parts for high-demand classic cars is a big business, and the Chevelle SS is a popular car to clone. Getting a replica VIN is relatively, but there are some tricks you can use to know the difference between factory original and aftermarket replica. Mike Crown, from MysteryChevelle.com, is an expert on 66/67 Chevelles, and told us that when it comes to the mighty 13817/13867 model numbers, you can tell if the VIN plate is original to the car by looking at the rivets. Factory rivets were rosette/star shaped, while aftermarket rivets typically found in a clone will be round. The information on the VIN plate will be duplicated on the trim tag, which is often called a cowl tag, and it’s important to know what both look like. Crown tells us that you can look to the rivets again to help determine if the trim tag is a replica. Factory rivets were a hollow type open rivet. Many of them were covered in black goop during assembly and may be difficult to get a good look at. If the trim plate is held on with round-headed rivets, or screws, you can no longer be sure the trim plate is original to the vehicle. Things like font type and code placement on the tag can clue a trained eye to the originality of the vehicle, but these things aren’t easy to spot, and you have to know what you’re looking for. Each plant used slightly different variations during assembly, even from year to year, and if you’re prepared to do your homework, you’ll be better off to spot fakes. Of course one of the most important parts of a Chevelle SS is that big block engine. Crown tells us that the deck pad will be instrumental in determining if the engine is numbers matching, meaning it’s equipped with the same engine it left the factory with. While several different assembly plants produced the cars, there was only one plant that produced the Big Block Chevy engines, the Tonawanda, New York engine plant. They stamped the assembly date on the bare block pad, and then shipped it off to meet up with the car. The final VIN was added to the pad by human hands at the destination plant, ensuring that the pad will have two entirely different appearances to the numbers found on it. Again, each plant used different variations, and if you know these variations, they become ways to tell if the deck pad, and the engine it’s attached to, is original. 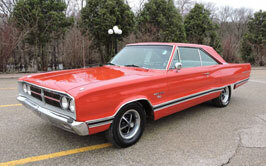 Crown says it’s OK to be untrusting of anyone trying to sell a high-dollar classic car. Cloning the Chevelle SS was/is a big business, and after many years, there are probably some sellers that don’t even know what they’re selling is a fake. We mentioned in our Scams article that doing your research and not being too quick to jump on a deal that’s too good to be true is the best way of protecting yourself from making a decision you’ll come to regret. That advice holds true here, where taking the time to research the vehicle can turn up clues to help you be sure of what you’re getting. There are hundreds, if not thousands, of variations auto manufacturers introduced to the Chevelle SS over the years it was produced at numerous different plants. Once you have some information about the car, you can begin looking into the finer details that could prove it to be true or fake. If you’d like to learn more about identifying a Chevelle SS, especially for the 66/67 model years, Mike Crown’s MysteryChevelle.com is an excellent place to start. You’ll find valuable resources there, assembled by a passionate collector with years of experience.